Vandersteen lovers, of which there are many, may stare in disbelief at these words, but AXPONA 2019 marks the first time that I truly got why so many people rave about Vandersteen’s sound. At least I think I did. Even if I didn’t fully get what other people get, I got enough to say, “Oh yeah, uh huh, that Vandersteen midrange is surely something worth writing home about.” In fact, based on what I heard, I see why some people would prefer to cart up the whole thing and let it do the speaking. 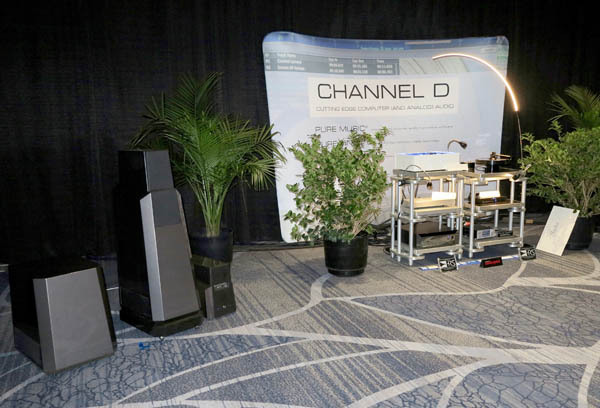 Another first: AXPONA marked the show premiere of the full Vandersteen System 9 ($152,898/pair—another way of saying it had sure better sound good). This comprises the Model Seven Mk II flagship loudspeakers ($63,999/pair and up), liquid-cooled M7-HPA High-Pass amplifier ($59,999/pair and up), Sub Nine ($18,900/pair and up), and System Nine Bedrock granite base for the Model Seven ($10,000/pair and up). Channel D’s Rob Robinson began with a 24/192 Pure Vinyl burn of singer Juliette Gréco. The midrange sounded gorgeous, warm, and lovely. Colors were exceptionally well defined, and you could hear some of Gréco’s natural edge at the top of her fine voice. All the charm of her performance came through with rare beauty. Next came André Previn and the LSO’s recording of Tchaikovsky’s 1812 Overture, from an old Tchaikovsky Spectacular LP. I was especially impressed with Previn’s opening, which through this system was not only calm, smooth, and exceptionally liquid, but also conveyed an almost funereal, idiomatically Russian sense of gravity. Bass extension and control were quite decent—this was a hotel conference room, after all—but the very bottom was a bit muddy, and I felt that you could hear when the subwoofer kicked in. Nonetheless, what impressed me the most was beauty of sound. The strings at the start of the 1812 were to die for. 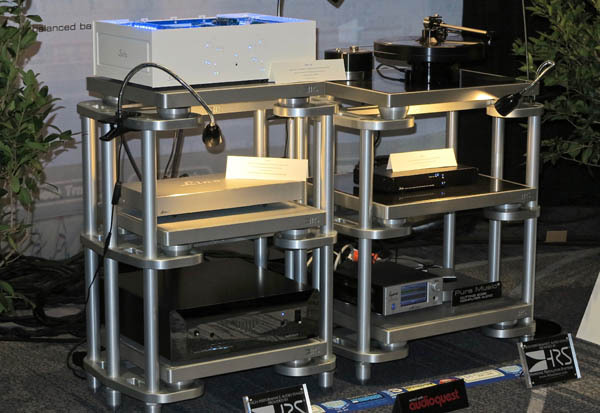 Also in the system: Channel D Pure Music software ($129), Pure Vinyl software ($399), Lino C phono stage ($2,499), Seta L phono stage ($4,998), and Seta L20 phono stage ($63,000); AudioQuest Niagara 7000 ($7999.95) and 5000 ($3999.95) power conditioners, and a whole mess of Hurricane and Blizzard power cables, Fire XLR balanced interconnects, and Coffee USB; and a Harmonic Resolutions Systems SXR Silver equipment rack with six isolation platforms ($29,625).